These 1.83m Lap Fence Panels are one of our most popular sellers. A traditional and popular panel providing excellent privacy and security for your garden. The horizontal boards feature a smooth edge rather than the traditional wavy edge, creating a cleaner looking fence. You can expect this panel to stand the test of time – three vertical battens on both sides and sturdy edging make this panel a very secure one. This panel has been dip treated to provide protection against rot and fungal decay for up to 10 years. 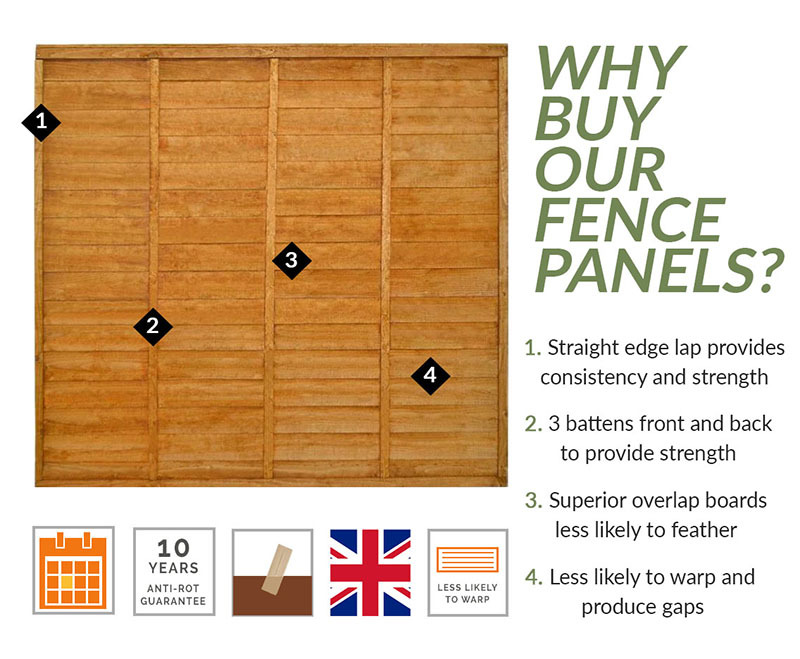 The excellent build and durability of our Lap Fence Panel 1.83m make it one of our most popular fence panels. Its strong, straight lines create a traditional and elegant garden boundary. It is constructed using smooth edged horizontal boards with a robust framework and three battens for added stability. This panel has been dip treated to provide a 10 year guarantee against rot and fungal decay. We recommend using our rough sawn timber posts and pressure treated gravel boards with this panel for a lovely matching finish.